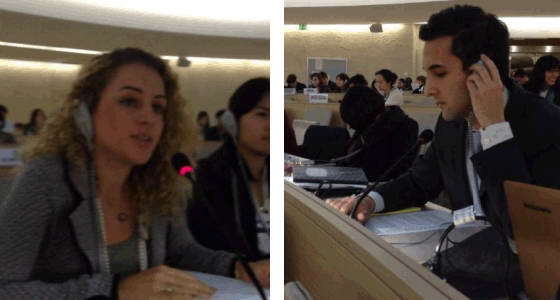 As members of the Unrepresented Nations and Peoples Organization, the Assyrian Universal Alliance participated in the Fourth Session on the Forum on Minority Issues in Geneva, Switzerland at the Palace of Nations from November 29-30, 2011. The forum’s focus examined recommendations on “Guaranteeing the Rights of Minority Women” and was chaired by Ms. Graciela J. Dixon, former Chief Justice of the Supreme Court of Panama with Draft Recommendations issued by the Independent Expert on Minority Issues Rita Izsak. In line with this year’s theme, the AUA representatives Ms. Jennifer Babaie and Mr. Alen Mirza from the United States provided interventions focused on the situation of Iraqi Assyrian women in post-conflict situations. Ms. Babaie’s statement advocated for specialized bilateral and multilateral bodies aimed solely at battling human trafficking among Assyrian women refugees while Mr. Mirza recommended the establishment and support of Assyrian women civil society groups in Iraq as a means of combatting economic and political disenfranchisement. In attendance were delegates from various governments including the Republic of Iraq, Islamic Republic of Iran, Australia, and the United States along with prominent non-governmental organizations like Minority Rights Groups International. Copies of the AUA’s intervention will soon be posted on the website for the UN’s Human Rights Committee along with the Final Recommendations adopted by the Independent Expert.